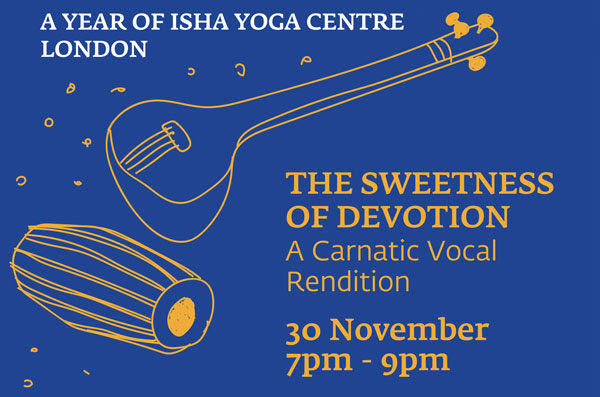 It gives us great joy to announce that our centre in London will be celebrating its first-year anniversary on the 30th of November. With the grace of Sadhguru and the love and dedication of the volunteers, the centre has grown to become an oasis of joy, bursting with life and full of cheerful faces! We are thrilled to celebrate this special occasion by organising an 'Evening of Culture' at the centre. will render a special performance focusing on the sweetness of devotion and the sheer abandon and ecstasy that comes from it. The performance will take place between 7-8:45pm, followed by a cake cutting ceremony. We warmly welcome you all to join us to experience both the sweetness of devotion, and the cake! The 3rd of October marked a thrilling day in the calendar for meditators across Europe, with Sadhguru sojourning the elegant and historic city of Paris for a Sathsang. 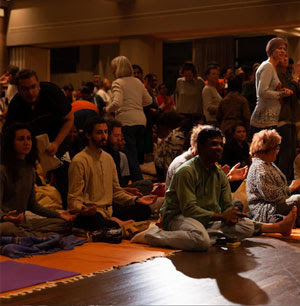 Paris is known as the City of Light, and the Satsang did prove a light-hearted affair! Sadhguru in his trademark style managed to address many of the burning spiritual queries, all the while maintaining a jovial and conversational tone. The home grown Sounds of Isha troupe maintained the glowing ambience with beautiful renditions of Kabir and various other hits. Just as the Sathsang was wrapping up, Sadhguru surprised everyone by revealing his plans for Europe in the coming year. He announced plans to hold his first ever European tour comprising a multitude of countries, including the UK. The time is indeed ripe to spread tools for inner wellbeing across the continent! Sadhguru’s announcement certainly charged up the volunteers to make this a reality. A volunteer’s meet was convened at the centre to paint a preliminary roadmap going ahead and to discuss the different activities required. 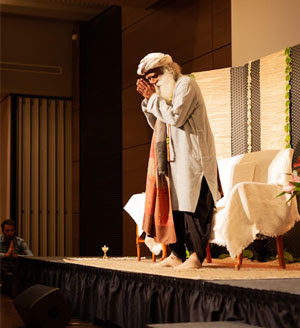 It focused on the unprecedented opportunity to generate a wave of awareness and touch the lives of as many people as possible through Sadhguru’s physical presence in Europe. Everyone realised the potential of reaching new levels of outreach through focused efforts geared in one direction. On this note, the meeting concluded, and the volunteers disbanded with a new sense of passion and focus. Isha in UK and Europe will be bursting at the seams with the plethora of programmes and events scheduled in 2019 and we need as many hands as possible to help us out! As part of our endeavour to spread the simple tools of transformation that Sadhguru has given us, Isha volunteers have been active in various social and cultural events across London throughout October. 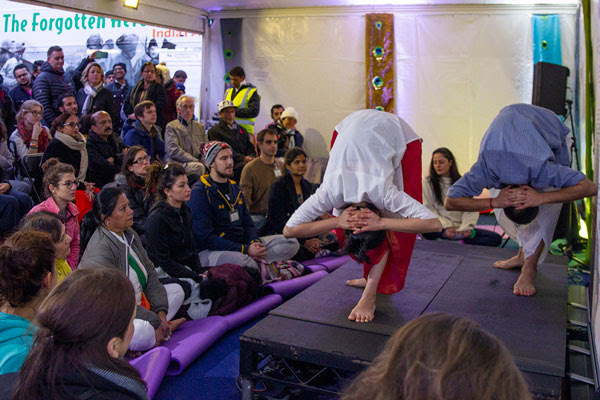 On the 28th, Isha Hatha Yoga teachers mesmerised the crowd at the mega Diwali Celebrations in Trafalgar Square with an exquisite display of the powerful and ancient system of Angamardana. Even amidst the noise and cheering, the audience fell quiet, fascinated. The team of volunteers were later told by the organisers that it was simply the best attended yoga presentation during the entire day, and it attracted even twice as many compared to similar displays! Similarly, at the Yogific festival in Greenwich, participants were highly intrigued by the Isha practices and more than a hundred stayed back following the event, eager to learn further details about Isha! The cherry on the cake for the social outreach efforts this month was undoubtedly winning the 'Best Stall' award at the Mega Telangana Jagruthi event in East London, with people from Indian diaspora in particular spellbound by the poise and balance of the volunteers! What impact have we made? The response to Isha’s flagship Inner Engineering programme continues to rise, and we hope to schedule an increasing number of them in the months ahead. We had two fully booked Inner Engineering Total programmes in the month of October with more than 80 seekers taking their first steps towards inner wellbeing. "At Isha, Hatha Yoga is not just an exercise, but a way to master your body and mind"
We were delighted to offer Bhastrika Kriya for the first time at the centre and it was well received with more than 15 participants attending the programme. Yoga for Children is fast becoming one of the most popular programs with another fully booked class this month! Warm up naturally this Winter! On the menu from the 5th-8th Nov is Angamardana, an ancient yogic system of fitness. This practice is a complete workout by itself and gives everyone the opportunity to invigorate the body and to reach peak physical fitness. All you require is a 6 by 6 space, and your body is everything! Click to hear Sadhguru speak about Angamardana! Make sure your solar batteries are fully charged this November. We will be offering the Surya Kriya Workshop on the 12th-13th Nov at the Isha Yoga Centre. This process is a powerful method to align with the solar cycles and activate heat in the system to keep you ignited even in the cold. With this practice, you can align your inner geometry in such a way that circumstances within and without do not obstruct you. Click to hear Sadhguru speak about Surya Kriya! To cater to the frequent requests to conduct more programmes in the morning, we are thrilled to announce a wide range of workshops, guided sessions, tasters, meditations and more before daybreak! These sessions are perfect for those whose schedules offer more flexibility in the morning and would like to invest their energies on themselves early in the day. If you are interested in any of these programmes you can register now or read more below! Isha Yoga Centre is now open daily! Balance is the most important thing for people who are seeking to be successful in whatever field they choose. Modern societies have ignored this aspect and they are paying a huge price for it today. Sadhguru says, only if you have a balance which is not disturbed by external situations will you be capable of making use of the competence and intelligence that you carry within you. Otherwise the most wonderful qualities that one may have will all go waste, simply because of lack of balance. because physical body is the easiest thing to work with. Unlike the mind, the body is a reliable factor. If you work with it sensibly the yogasanas will definitely lead to the higher possibilities. The least that can happen, is an inner alignment which will naturally achieve a chemistry of healthfulness, joyfulness and blissfulness and above all balance. Aspire for greater success and join the growing number of seekers benefited from the Hatha-Yoga offerings in UK and Europe. "The event Yogific has been a great experience for me as a volunteer. The involvement I experienced and the response from the public received in return brought a lot of joy to the group of four that we were. 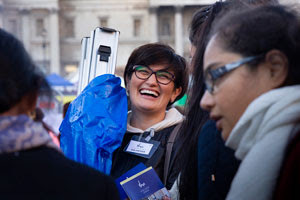 Whenever I was walking around the stalls during the day, it felt like every single person around me was an Inner Engineering participant as if we had taken the IYC out there in Greenwich. It is thrilling and motivating to attend such events and bring out the technologies that are changing my life as a possibility to more and more people." All programmes and events within Isha are volunteer run. It takes a tremendous level of effort to make this happen, and they're only possible as a direct result of volunteers' love and dedication. If you wish to volunteer, please fill in this survey or get in touch with us on volunteers.uk@ishafoundation.org. Have a creative flair? Love creating campaigns that capture people's imagination? Passionate about becoming a part of Sadhguru's vision for an inclusive and joyous world? If you are nodding your head in agreement, then we need you! We are looking for motivated graphic designers who will be able to use their creative flair to come up with striking visual designs to help promote Isha's activities in Europe. We are planning to scale up the number of programs that we offer, and we will need your support in reaching the maximum number of people. If you are willing to support us for even a few hours a week either remotely or at the Isha Yoga Centre, London please message us on london@ishafoundation.org. The centre was established after over 10 years of continuous efforts thanks to the goodwill of Isha meditators. 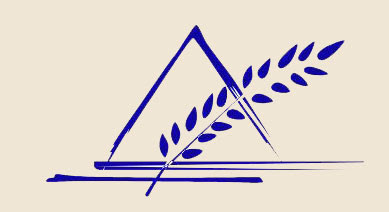 It is now poised to lead the way in offering tools of inner transformation across Europe and you can support this endeavour by donating towards the running costs of the centre. If you are a UK taxpayer, your donation is tax free and eligible for Gift Aid.